Extensive evidence, supplied to the World Anti-Doping Agency (WADA) by journalists who campaign against corruption in Turkmenistan, shows that Umurbek Bazarbayev, a four-time Olympian and one of the nation's biggest names in sport, was appointed in the first year of a four-year suspension — in blatant contravention of the rules. Both Bazarbayev and the Turkmenistan Weightlifting Federation face sanctions. The evidence includes several references to Bazarbayev, in the state-sponsored media, as assistant national coach. He is also named, under the alternative spelling of Umurbek Bazarov, on the IWF's own website as coach of Kristina Shermetova, one of Turkmenistan's top performers who finished seventh with a career-best total in the women's 55 kilograms this week. Bazarbayev, 37, tested positive for anabolic steroids when he competed at the 2015 IWF World Championships in Houston, Texas. He was suspended for four years until December 10, 2019 and under Article 10 of the WADA Code was ineligible to ''participate in any capacity'' in the sport. Any suspended athlete found to have contravened Article 10 is liable to another ban equal in length to the original, starting when the first ban ends. If applied to Bazarbayev it would keep him out of weightlifting until 2023. 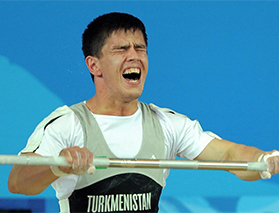 The Turkmenistan Weightlifting Federation could also face punishment by the IWF. A spokesman for WADA told insidethegames: ''We are aware of the circumstances around this. ''The IWF has informed us that it is following up in the appropriate way. The IWF also checked that Bazarbayev's name did not appear in the registration for team officials for the World Championships. He was not accredited, and may have been forced to withdraw from his coaching role when the Turkmenistan Federation learned that they had been reported to WADA. Journalists from gundogar.com, a website that reports on Turkmenistan from outside the country, sent details of Bazarbayev's involvement to WADA and the IWF in August, the month when the coach's name began to disappear from reports. It is not known if Bazarbayev worked with the team after August, but gundogar.com evidence shows that he was appointed in 2016 and worked for about two years. He was working at a pre-World Championships training camp in Georgia in the first week of August this year. Tom Goegebuer, President of the Belgian Weightlifting Federation and a member of the IWF's Clean Sport Commission, said: ''The coach is one of the most influential people in the staff around an athlete, so suspended coaches are completely unacceptable from a moral point of view. ''Weightlifting is in need of strong signals that doping is not accepted, so of course I stand strongly behind the strict application of the WADA rules. Bazarbayev lifted four times at the Olympic Games, at 62kg, and until his suspension he was lauded by the Turkmenistan Government as the man who would become the first weightlifter to compete at the Olympics five times. He was a top-10 finisher in Athens 2004, Beijing 2008 and London 2012, having failed to make a total on his Olympic debut at Sydney 2000. This is the second controversy for the host nation's team. Their original list of 20 athletes was reduced to eight because so many were ineligible, having failed to update their whereabouts information on the global anti-doping database. Questions about the appointment of Bazarbayev, and the level of governance with the Turkmenistan Federation, were sent to its President, Berdyniyaz Myatiyev , but there was no reply. He said that Myatiyev is the acting deputy minister of foreign affairs in the Turkmenistan Government, and is ''a close personal friend of the country's President's son".